Sunshine Yellow is the color of the moment, if you ask me - regardless of what Pantone has to say. It's everywhere. 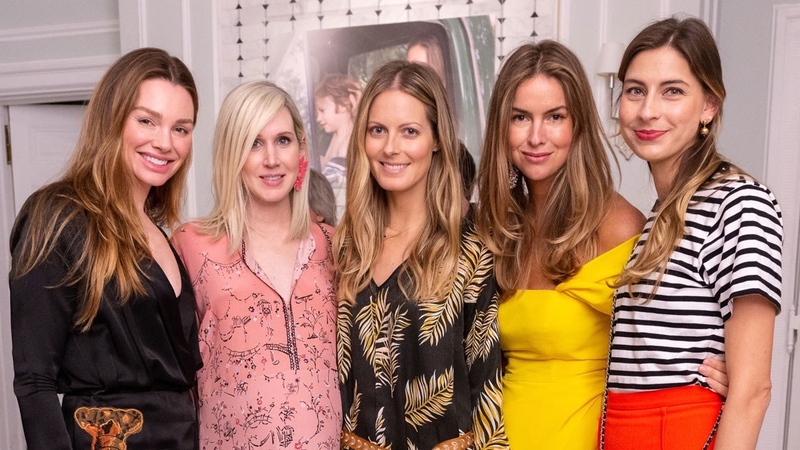 But, nowhere is it prettier than in the bright sunshine yellow Carolina Herrera frock that Claiborne Swanson Frank wore to her Clé de Peau* sponsored book party last week. It's a showstopper. I've been crazy for this dress since I first saw it on the runway last fall and when it hit the pages of the fashion magazines in Carolina Herrera's Spring 2018 Campaign. (Actually, Carolina always seems to include at least one gorgeous yellow dress in every Spring Collection - she must, like my mother (and Nancy Lancaster before her) have a lifetime obsession with yellow). Can you even get over how gorgeous my girl Claiborne looks? Everyone else just kind of looks blah standing next to her. It could also be that she is rocking a fabulous tan and also that she is pretty gorge even without the dress. Get your own yellow vibe going with this fabulous (and pretty reasonably priced) option by Rachel Comey (it comes in black if you prefer and also if you want to see how it looks on a person), and other even more affordably priced options by Levi's Made and Crafted, M.I.H. Jeans, ASOS, and Topshop. I'm also digging this slides in lemon yellow. *Pretty crazy for their Translucent Loose Powder. It's legit.